SOUTH HOLLAND, Ill. (WLS) -- For the first time in decades, people can camp in some Cook County forest preserves. 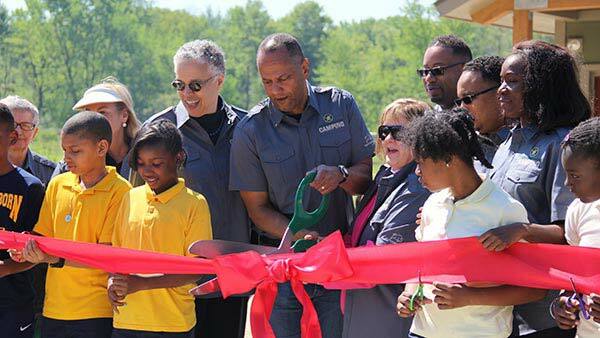 Camp Shabbona Woods in South Holland opened today. County Board president Toni Preckwinkle was among the political leaders on hand for the ribbon cutting. She says people no longer have to hit the road to Michigan or Wisconsin to camp. "For the first time in 50 years, some of them will be able to go a much shorter distance," Preckwinkle said. "They'll be coming here to Camp Shabbona to enjoy the wilderness of Cook County." The site features cabins, tent pads and RV drive ups. Four other new or renovated campgrounds will open this summer.